How Is AI Used For Data Cleaning? The data cleaning task is far from exciting but it is crucial enough if you want to get the desired revenues out of your marketing gimmicks. Cleaning the data involves filling out missing information, removing outliers that contort the results, logging regime changes and removing redundancies from the database. If you wish to examine your business trends in consumer spending costs from one year to the next, a wrong percentage in a previous year can ruin all the analysis moving forward. Hence, going in and cleaning up the data becomes critical for restoring integrity to the present figures. The real logical question here is, can humans find the errors manually? Humans enter the data in the database and because it is a given fact that ‘humans make mistakes’, and therefore inaccurate data finds its place in the dataset. Artificial Intelligence programming can perhaps provide some course correction when human mistakes lead to inaccuracies in the database. The AI’s ability to carry forward a multitude of tasks continues further. In the past years of data cleaning manual ways and standard computer programs were the only means available for looking up for errors and then fixing them. Letting the values of these methods lose wasn’t a wise option as any tool that helps in locating the errors deserve some appreciation. However, these methods had their limitations that affected their total effectiveness. In this case, Artificial Intelligence, owing to its learning potential, can address these limitations and diminish them. Businesses having a tremendous amount of data can be used to understand the ways in which their customers behave and provide experiences thereby deriving their key choices that can help businesses to develop. However, with large data, analyzing and interpreting this information is difficult. You cannot anticipate each and every circumstance or possibility and therefore the frameworks which learn become a good fit. If you concentrate on machine learning it will provide a more flexible way of dealing with the improvement as compared to the traditional data-driven patterns. Artificial intelligence makes analyzing the information and making estimations possible as well as learning and changing as per the estimate precisions. The estimates progress, more information can be analyzed. It is important to clean the data for a pivotal and error-free database. The act of data cleaning includes error prone actions that affect the data examination unpredictably and influences the credibility of the whole process. The data cleaning and quality jobs are portrayed here as per artificial intelligence strategies. The task of data cleaning looks easy for those who are seeing it from the outside. However, in reality, it is a difficult procedure that includes different steps that have been deliberately picked and are carefully fir for the data index. Data cleaning is not a procedure that can be played out continuously in the same monotonous manner and getting the desired results. It may include the same repetitive strategies running in cycles that are connected exactly from the data accumulation phase until the end of the model. 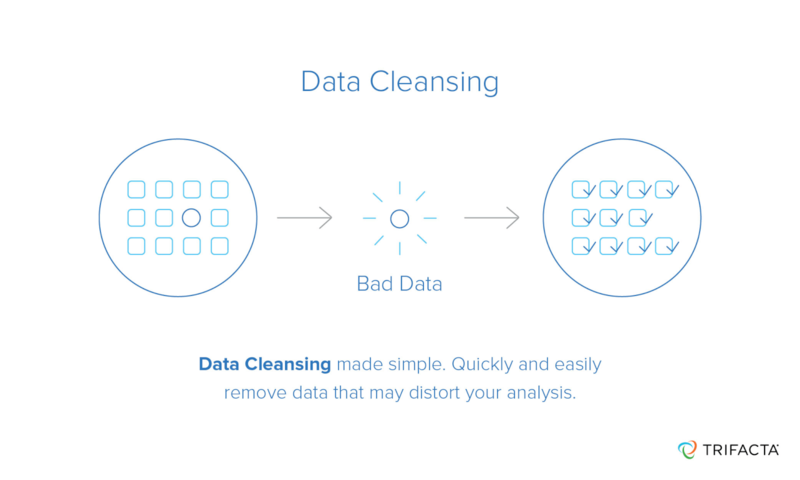 The data cleansing best practices include the application of a detailed analysis of data at the initial phase for identifying different sorts of irregularities and errors that should be expelled from the database. Avoiding the time taken for manual assessment of the data or the samples, the analytic programs are, more often than not, expected to pick the metadata from the resources and differentiate the issues faced in data quality. There are programs that use machine learning supports, but since the data can be retrieved from multiple unique sources, the data cleaning process consequently requires steady configuration of the data for easy and simple utility. There should also be a guarantee that every data in the database has a similar pattern and shape. Changing the steps of information may also be required depending on the quantity of the data retrieval sources, their level of diversity and grievousness of bad data. At this point, you should ensure that the work transformation process should be adequate and the definitions should be assessed as well as analyzed. Several cycles of planning, analyzing and checking the steps can be required likewise. After removing the errors the bad data should be replaced by the cleaned data in the primary sources. This step ensures that the legacy applications can also access refreshed data so that potential revision for removal of information can be limited. Artificial Intelligence ensures that the data is cleaned effectively. Since human errors are inevitable but not acceptable, the use of artificial intelligence helps in removing the errors from two of the most error inclined regions namely. These regions include finding bad data at the initial phase and refreshing the models after that as per the requirement. Low turnaround time for data cleaning will bring out a constant analysis of the present information irrespective of its main format. This will thus deliver speedier and significant data. AI guarantees clean data which is installed in a standard format will help dispose of the re-work and empowering the development team to perform immediate investigations starting from the root of the issues so that they can be directed rapidly. This is very critical since the early determination of the issues can guarantee that the data pipeline can continue streaming without any roadblock. The more information that you submit in the model for regularity, the better it gets. Therefore, unlike the traditional data management process and cleaning systems, artificial intelligence can help improve the situation with magnitude. In short, artificial intelligence can perform a large portion of work for you. By using the AI you can smartly understand the uses, rates and data analysis which can be determined while shortening coding and cleaning hours in bad data.